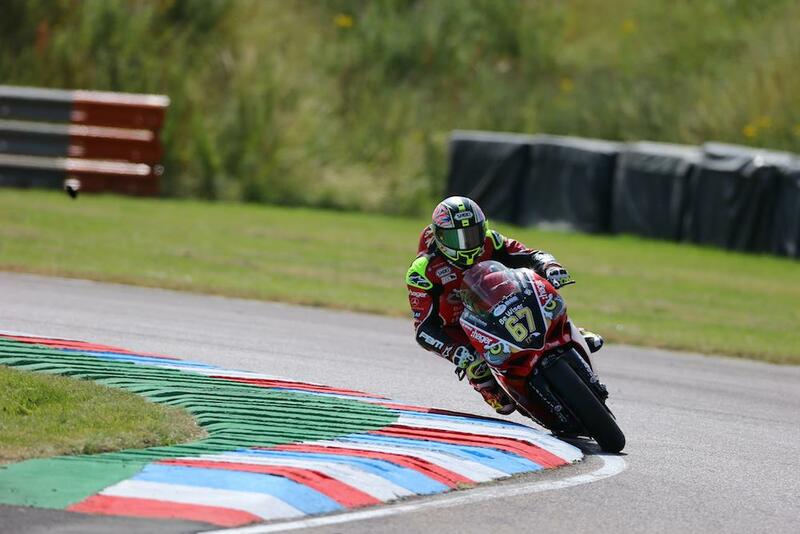 Shane Byrne dominated the opening day of proceedings at the sixth round of the 2016 MCE British Superbike at Thruxton, decimating the lap record to top both first the first and second practice sessions. With a bike largely unchanged from his victory last time out at Snetterton, Byrne was untouchable on the first day at the Hampshire circuit as he continues to make progress with the Panigale R.
Byrne, the oldest rider on the grid, was chased by two young guns in the shape of Luke Mossey and Lee Jackson who set the second and third fastest times respectively aboard their BMW and Kawasaki machinery, with Jason O’Halloran slotting into fourth for Honda Racing. Ryuichi Kiyonari enjoyed a big step forward for Bennetts Suzuki in sixth, ahead of Tyco BMW’s Christian Iddon and BSB newbie Jake Dixon. Michael Laverty was ninth while Peter Hickman rounded out the top ten as the leading JG Speedfit Kawasaki, with team-mate’s Leon Haslam and James Ellison in 15th and 25th.